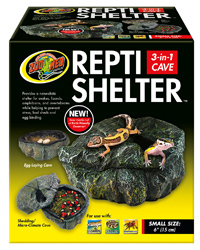 Zoo Med's New Repti Shelter 3 in 1 Cave is a unique, natural looking, and multifunction reptile den. The humid micro-climate inside allows hiding, aids in respiratory function, eases shedding, and provides an egg laying site for many species of snakes and lizards. The Repti Shelter 3 in 1 Cave is available in 3 sizes to accommodate most pet reptiles and splits in half for easy access.